Heartfelt, challenging, rootsy singer-songwriter-guitarist. Features guests Syd Straw, Peter Case, Greg Leisz, David Mansfield, and more. Few artists are as committed to their craft as Mike Meltzer. Whether it’s the lyrics, the music, or the all-important recording process, the Southern California-based musician takes nothing for granted. This fact is evident on his CD The Big Go-‘Round, an album full of powerful messages, memories, and stories. Meltzer and co-producer Willie Aron (The Balancing Act, Victoria Williams, Peter Himmelman, Rebecca Pidgeon) have crafted ten outstanding songs into an inviting variety of musical settings. Meltzer says the songs themselves are the true producers and that certainly plays out on The Big Go-‘Round. 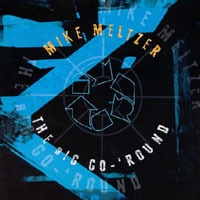 The Big Go-‘Round is a series of portraits revealing Meltzer’s musical journey. From being impacted by the explosion of musical creativity in the sixties and seventies, to his rich and diverse musical training, to learning the art, as well as the nuts-and-bolts of engineering and producing (Meltzer has worked with several artists at his studio, including some recent Peter Case projects), Meltzer has gained the experience and knowledge to know exactly how he wants to make music, and exactly how to accomplish it. He decided long ago that his songs needed a direct and spontaneous approach, and the vocals and rhythm tracks were recorded live to preserve this aesthetic. Boasting contributions from such luminaries as Peter Case, Syd Straw, D. J. Bonebrake (X), Danny Frankel (Lou Reed, Rickie Lee Jones, Victoria Williams), Greg Leisz (Joni Mitchell, k.d. lang, Dave Alvin), David Mansfield (Bob Dylan, the Alpha Band) and co-producer Aron, The Big Go-Round is a marvel of honest songwriting and arrangements that perfectly capture the mood of the lyrics, ranging from the uplifting folk-rock of “After the Darkness”, to the bluesy “Right Train”, to the Holly/Orbison rockabilly of “Oh Well”. Lyrically, Meltzer takes his cues not only from such acknowledged architects as Dylan and Lennon/McCartney but also from classic authors like Steinbeck, Chandler, Raymond Carver and Flannery O’Connor. His songs tell stories with an eye for emotion-colored detail, like the victim of abuse who is encouraged to overcome her trauma in “After the Darkness”. “Beat the Odds”, a duet with Syd Straw which Meltzer wrote for his sister’s wedding, reminds us how rewarding it is to find, and hold on to, the right person; and the Southern Gothic influence of O’Connor shows up in the stark “Wait For Jesus”, inspired by a newspaper account of a mother leaving her small child in the woods with those words, and written in a powerful prose style. The title cut is an inspiring plea to take control of one’s life. In a cynical world, it’s a refreshingly positive message with an upbeat arrangement that complements the message. “The Man Who Would Be King” is a tough but honest look inward, and although it’s a portrayal of regret, the song is laced with the resolve to learn from mistakes. The song is carried by Meltzer’s finger-picked 1929 Martin acoustic guitar. The Martin is the centerpiece of an album filled with impressive guitar textures both acoustic and electric, mostly provided by Meltzer himself. The country-tinged “Say Lisa”, featuring David Mansfield on fiddle, dobro, and mandolin, is surely one of the album’s highlights. It’s a love song of touching grace. Equally affecting is “Damn Blue Skies”, a look at a love that didn’t work out quite so well; the lovely melody and lonesome lyrics captured perfectly on the album’s only song to feature Meltzer solo with his guitar. It’s an effective way to end an album rich in emotion, texture, and depth. With The Big Go-Round, Meltzer has produced an album that bridges the gap between an artist’s soul and a perfectionist’s mind.